As of late, Intel has been unusually guarded about releasing information about its microprocessor designs. Haswell launched last year with great architecture disclosure, but very limited disclosure about die sizes, transistor counts and almost anything surrounding the interface between Haswell and its optional embedded DRAM (Crystalwell) counterpart. This week at ISSCC, Intel will finally be filling in some of the blanks. 4+3 Quad-Core GT3e 260mm2 + 77mm2 1.7B + ? I've organized the table above by decreasing die size. I still don't have confirmation for the ULT 2+2 configuration, but the rest is now filled in and accurate. If you remember back to our Iris Pro review, I measured the die area for Haswell GT3 and the Crystalwell eDRAM using some cheap calipers. I came up with 264mm2 + 84mm2, the actual numbers are pretty close at 260mm2 + 77mm2. 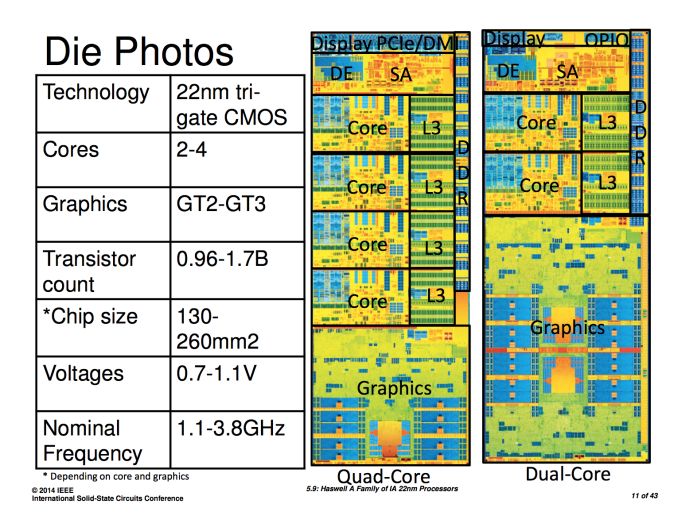 Doing some rough math we see that the addition of a third graphics slice to a Haswell core accounts for around 300M transistors. That would put the ULT2+2 configuration at around 1B total transistors. I suspect the ULT 2+2 configuration is similar in size to the quad-core + GT2 configuration. The 128MB eDRAM is divided among eight 16MB macros. 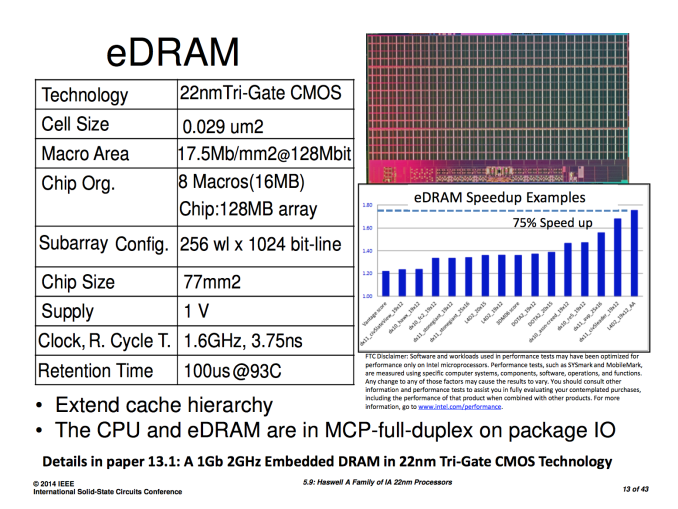 The eDRAM operates at 1.6GHz and connects to the outside world via a 4 x 16-bit wide on-package IO (OPIO) interface capable of up to 6.4GT/s. The OPIO is highly scalable and very area/power efficient. The Haswell ULT variants use Intel's on-package IO to connect the CPU/GPU island to an on-package PCH. In this configuration the OPIO delivers 4GB/s of bandwidth at 1pJ/bit. When used as an interface to Crystalwell, the interface delivers up to 102GB/s at 1.22pJ/bit. That amounts to a little under 1.07W of power consumed to transmit/receive data at 102GB/s. By keeping the eDRAM (or PCH) very close to the CPU island (1.5mm), Intel can make the OPIO extremely simple. Intel also shared some data on how it achieved substantial power savings with Haswell, including using a new stacked power gate for the memory interface that reduced leakage by 100x over Ivy Bridge. Haswell's FIVR (Full Integrated Voltage Regulator) is also a topic of discussion in Intel's ISSCC papers. 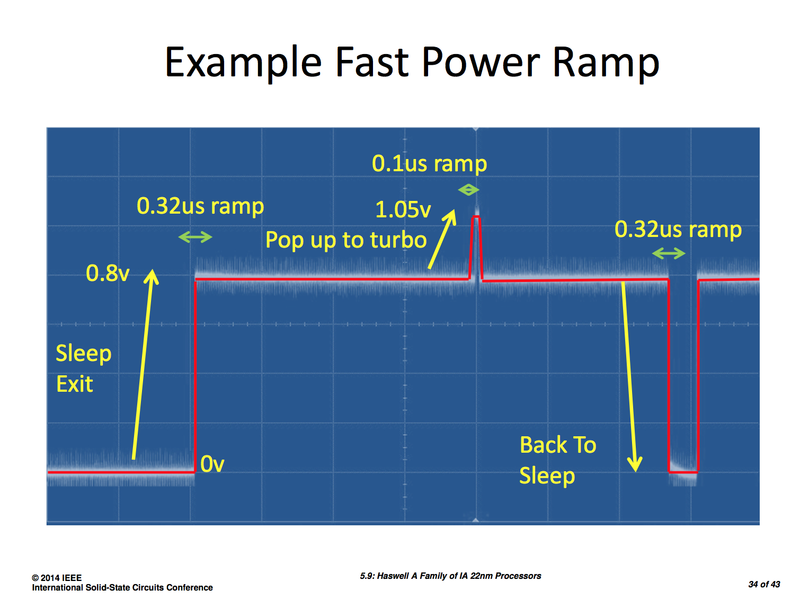 FIVR ends up being 90% efficient under load and can enter/exit sleep in 0.32µs, requiring only 0.1µs to ramp up to turbo frequencies. Intel's Haswell ISSCC disclosures don't really change anything about Haswell, but they do further illustrate just how impressive of a design it is. It's fascinating to see how they can just keep finding ways to do things better. I'm sure whomever figured out how to reduce leakage on the memory interface by 100x got a nice Christmas bonus! Right before the Kernel for Linux reaches 3.15 or right after. Any word on Broadwell? I heard it will have a new graphics architecture and DDR4 support. DDR4 isn't coming to mainstream Broadwell version. It still uses DDR3. As mentioned, Haswell-E will use DDR4. (More specifically LGA2011-3 spec uses DDR4...It is NOT compatible with existing LGA2011). * Die shrink; 14nm process node. * GT3e (Iris Pro IGP) will be available in more models compared to Haswell. => Expect it to be in the multiplier unlocked "K" versions of the Core i5 and i7 desktop processors. => Still use Gen8 architecture IGP from Haswell. * Both Haswell-Refresh and Broadwell will use a different LGA1150 socket variant. * The upcoming 9-series chipset will introduce SATA Express interface. => Improving multiple precision arithmetic (integer) performance. => Meeting random number generation specifications like NIST SP 800-90B. If you want DDR4 to be mainstream, wait for Skylake in 2015. > => Still use Gen8 architecture IGP from Haswell.